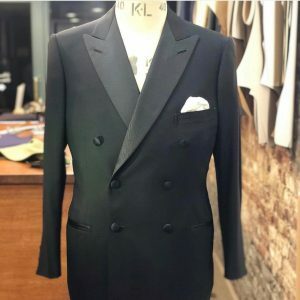 A few decades before the inception of Standeven, the highly esteemed Henry Poole on Savile Row introduced ‘Black Tie’, a practical yet formal outfit appropriate for certain special evening occasions and ceremonial wear, proving to be a timeless menswear staple all over the world. Photo: Dinner suit made by Juan Carlos Tailor of Shop Oliver Brown, in Escorial Wool. Before we dive into the what is, and why, of the black tie, it’s important to acknowledge a little backstory behind this wardrobe. There are many opinions and stigmatisms surrounding the almost age-old concept of what it is to be a gentleman and the various components of attitude, style and the way one should conduct oneself. While it would require an almost bottomless article to cover this, we can certainly make a start by focusing on the basics. To be a gentleman, one should not look for additional attention, especially to his clothes. Neither should he be seen to purposely out dress or outsmart his peers. This is also reflected in the way he puts himself together (as opposed to a dandy who looks to impress by dressing as a way of expression). Firstly, black tie formal wear is relatively strict for several reasons. One of which is to ensure all are dressed appropriately smart to pay respect to one another at an occasion. One should look appropriately immaculate. Think “Cary Grant” in the film “To Catch a Thief.” The dress style, tone and manner which Cary portrayed through his role, sum up the concept quite perfectly. Over the years, many people have adapted and bent the rules as they see fit, as certain occasions have also become less formal. This has seen an excellent opportunity, leading to the broader scope of what is deemed an acceptable outfit. The original attire requires a black suit of luxury fabric, often in an extremely thick Barathea cloth, with silk peaked lapels. A white studded shirt fashioned with a decorative bib, trophied with a black bow tie completes the look. Black shoes are a must and often worn as either an Oxford or slipper (always with mirror shine or Patina). Recently, the smoking jacket has made a resurgence in formal wear. Once restricted to only be worn for smoking, we can now see them ever more popular at black tie events. Often crafted in extremely fine materials exclusively reserved for the most special occasions, and worn with an embroidered suede slipper. 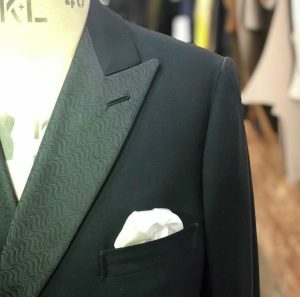 Due to the variety of weaves and compositions available today, the benefits of added durability and wearability are prevalent, making the dinner suit more versatile than ever before for both the occasion and wearer. Classic fabrics for formal wear and favourites of ours are the natural glow from the extremely fine and rare Escorial luxury fabrics or the animated appearance of mohair in low light environments. Whether you choose ultra-traditional or have a more individual interpretation on this formal wear, we hope you choose a classic fabric interwoven with as much of a rich history as this brilliant occasion has itself.